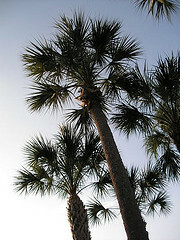 Sabal palmetto is the State Tree of Florida. It is a cold hardy native palm that lends a tropical ambiance to any landscape. It grows to about 50 ft tall, with a crown diameter of 12-18 ft. The leaves are fan-shaped. It can be grown in a wide range of soil types. It produces flowers in summer. The fruits are eaten by wildlife. Despite the fact that it germinates readily from seed, commercially available Sabal palmettos are always collected from the wild.